A key element to understanding sediment flux is the determination of accumulation rates in areas of net deposition. How fast (or slow) is sediment piling up? How is that rate distributed in space? How does it change over time? What does it tell us about the controls of sediment flux? Sweet. This is simple. Just measure the thickness of sediment (or sedimentary rock), divide by the duration, and interpret! Well…it turns out it’s not so simple after all. This post is a little bit about a very important paper that I don’t see cited enough. Sadler, P.M., 1981, Sediment accumulation rates and the completeness of stratigraphic sections: Journal of Geology, v. 89. A compilation of nearly 25,000 rates of sediment accumulation shows that they are extremely variable, spanning at least 11 orders of magnitude. Much of this variation results from compiling rates determined for different time spans: there is a systematic trend of falling mean rate with increasing time span. In other words, the longer the time interval measured the lower the sedimentation rate. The image below is Sadler’s Figure 1 with some of my scribblings on it. It is a log-log plot of sedimentation rate (meters per 1000 years) on the vertical axis and timespan (years) and thickness (meters) on the lower and upper horizontal axes, respectively. For now just focus on the ‘a’ figure … the one on the left. And also don’t worry about the Roman numerals (i, ii, etc.). The trend is pretty obvious. The data in the upper left have very high sedimentation rates, were measured over very short time intervals (hours to months), and are relatively thin. 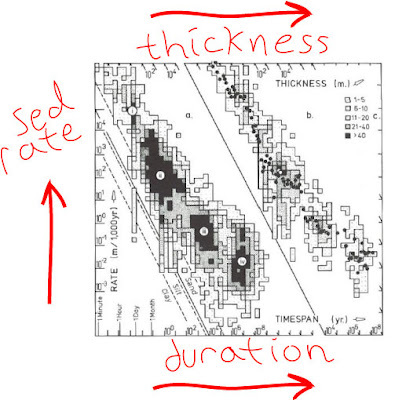 The area to the lower right represents sedimentation rates several orders of magnitude slower and have measured time intervals in the millions to 10s of millions of years. There’s some spread in the data of course, but in general this is a robust trend. What is underlying this relationship? The tendency for sediment to compact as it is buried (and thus become thinner) is a contribution but does not account for the bulk of the relationship. What you are seeing here is essentially the nature of sedimentation. It is discontinuous and highly spasmodic. In most depositional environments, the duration of actual deposition of sediment is very small compared to the time the system sits there doing little to nothing. I think Derek Ager said the history of sedimentation is like being in the military … hours of boredom separated by brief moments of terror. Sedimentary sequences…record the passage of geological time as an alternating set of sedimentary increments and gaps. The ratio of these two components is stratigraphic completeness. Sadler certainly was not the first to recognize this (another famous paper by Barrell, which I will post about someday, is notable for discussing completeness back in 1917) but this paper was the first to quantify it. A sizeable chunk of the paper goes through methods for calculating completeness. Several studies in recent years, including the popular paper by Molnar & England (1990), discuss the apparent increase in sedimentation rate observed in the last 20-30 million years. This has led to countless discussions about whether this signature is recording changing uplift rates or changing climate or both. Now of course we shan’t attribute this trend solely to Sadler’s measurement interval bias, because there very well may be an actual increase in rate. But, the point of this post is to highlight Sadler’s work and how we shouldn’t forget about it. Many of these papers do not even mention it. Sampling bias as a result for a study is not very exciting and probably won’t result in the cover of Nature or Science, but if we are to adequately deconvolve all the factors at play we need to remember biases like this. Molnar, P., and England, P., 1990, Late Cenozoic uplift of mountain ranges and global climate change: chicken or egg? Nature, v. 346. I am not a professional sedimentologist. But I found the comments on sedimentation rate quite interesting. Can anybody comment on the sedimentarion rates for clastic sediments and chemogenic sediments in Precambrian period. I am a hydrogeologist and I need these comments for some specific purpose. Firstly, I can’t say much off the top of my head regarding chemical sedimentation rates. Secondly, it very much depends on when in the Precambrian you are talking about. That is a very long time period and cannot be characterized by a “representative” sedimentation rate. Furthermore, then it depends on where…what kind of environment, etc. But, to take a stab at your question…calculating any kind of rate requires a good chronology — this is a big issue in the Precambrian. A similar phenomena occurs with sediment compaction rates. Details published in Meckel et al., Geophysical Research Letters (2006); Meckel et al., Basin Research (2007), and Meckel, Quaternary Science Reviews (in press). It is probably worth pointing out that Sadler and Others (including me) have shown that the statistical analysis in his original paper (Sadler, 1981) contains fatal flaws which, when corrected, show that long term sedimentation rates are actually pretty stable and not dependent on the time interval of measurement. Sadler, in 2011, published a paper specifically stating that long term rates of regional erosion and deposition are in rough balance and are fairly steady through time. Thanks for the comment. Yes, since writing this post (2007) I’ve seen some of the other work. I especially like the very recent Sadler & Jerolmack (2014) paper discussing these concepts further.